Note: as most brands are revamping their products to meet new standards and regulations, the information in this article is subject to change. Officially known as Lowell Herb Co., the brand exists as a living tribute to generations of cannabis farmers who strive to grow the finest cannabis organically and honestly. Lowell Farms’ inspiration dates back to the spring of 1909. That’s when William “Bull” Lowell planted his first Indian Hemp on his land on California’s central coast. Bull’s still-legal harvest angered Henry J. Finger, head of California’s Board of Pharmacy, who thought the crop was only used by “undesirables” (he went on to pass the 1913 Poison Act that effectively outlawed cannabis). Despite this backlash, Bull continued his passion for growing hemp until Finger threw him in jail. Lowell Farms honors Bull’s spirit. His example inspires their cultivation practices and company mission: growing cannabis naturally with a deep love and understanding of its benefits. Their business went from a small, family-run Santa Barbara farm to a thriving community of fellow farmers. 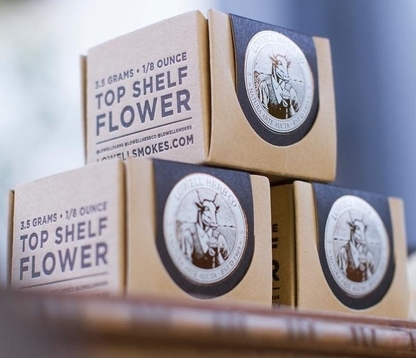 Lowell Farms outlines their cultivation practices right on the packaging; all cannabis flower grows naturally under the California sun with organic fertilizer. They only use all-natural materials from seed to sale, so no synthetic additives to worry about. When you buy Lowell Farms you get pesticide-free, lab tested, environmentally friendly flower every time. Yet what’s really special, and sadly far from common, about Lowell Farms is their relationship with their family of farmers. The company pays all farmers a living wage, encouraging collaboration, passion, and loyalty—a real cannabis community. You’ll feel this resonate once you experience their unmatched packaging and herb. Lowell Farms makes four stylish flower-based cannabis products. Don’t want to fuss over packing a bowl or rolling a joint? Just want the convenience of reaching into a pretty box and pulling out the perfect jay? These may be the holy grail of joints. The packaging is a truly visceral experience designed with much detail. 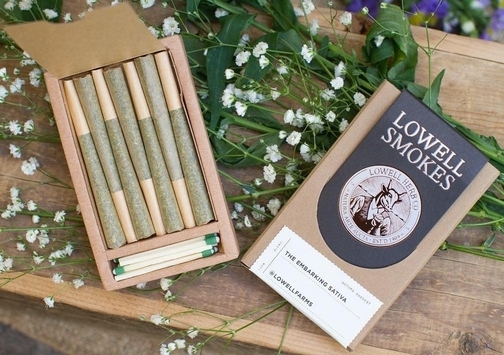 Each cardboard pack comes embossed and labeled with genetics, THC percentage, and growing practices along with Lowell’s brand story and pledge. Actually, the pack is more like a survival kit. Its reinforced tray is slim but sturdy enough to fit into your pocket without getting crushed while the tuck-flap ensures your pre-rolls stay fresh. Simply lift, slide the tray, and remove the wax parchment paper to reveal seven (3.5g total) or 14 (7g total) joints containing a half gram each. To add to the understated classiness, there are seven green-tipped matches and a striking surface, so you’ll never worry about losing or forgetting your lighter again. Plus it includes a sticker of their mascot and namesake, “Bull” Lowell. These prepackaged joints come in sativa, hybrid and indica options with specific strains dependent on small, seasonal batches (even a special “Coachella Blend” until receiving a cease and desist). And don’t worry about stems, shake or trim. If you examine one joint through the translucent paper you’ll only see 100% cannabis flower. The smaller pack costs $40-$50 while the larger pack sells for $60-$80. Great if you enjoy quality joints but can’t, or just don’t want to, roll one yourself. Everything we just said about the packs also applies to their individual pre-rolls. 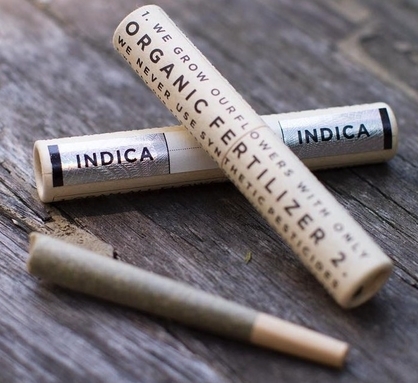 These one gram, all-flower joints have robust flavor, smooth smokability, and come in a convenient, resealable and recyclable cardboard doob tube. Sometimes one gram joints come packed unevenly, resulting in a jagged smoke that can waste weed and ruin your experience. Not here. A quick finger roll inspection will show there’s nothing trying to poke through the paper, only evenly packed, potent cannabis every time. Each joint will run around $10-$12. Love Lowell’s flower, but rather roll your own blunt or pack your own bong hit? Try their eighth (3.5 gram) glass jars. As you’d expect, their bulk cannabis flower grows using natural methods and adhere to the same standards as their other flower-based products. Their strain options vary throughout the year, bringing you the best seasonal assortments available. You’ll be smoking cannabis the way nature intended from color to taste. A jar sells for $35-$50. This is might be the coolest thing we’ve seen. 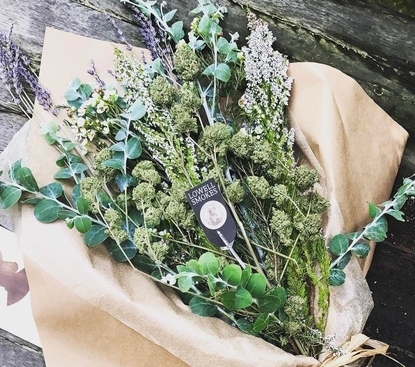 Lowell Farms makes incredibly beautiful bouquets made up of gorgeous greenery, wildflowers, and, the best part, one ounce of their high quality cannabis. It’s so artfully presented that at first glance you might overlook the cluster of buds mixed within. These bouquets will make anyone feel special. Next time your favorite MMJ patient or cannabis consumer has a birthday or needs an extra special pick-me-up, get him (guys won’t mind getting flowers as long as it’s cannabis) or her this artisanal bunch. There’s no doubt it’ll blow their mind. These bouquets don’t have a definitive price but sell on an individual basis. Contact Lowell Farms directly if you’d like to order. What’s fresher than receiving stalks of fancy California cannabis all wrapped in a gorgeous presentation? You’ll find Lowell Farms all over California cannabis shops. Although if you don’t have the time or don’t know where to start, check out Nugg’s online medicinal marijuana delivery service. Just input your address to discover local MMJ shops that carry and send their flower-based products to you. It’s free to sign up, yet you must have a valid medicinal marijuana recommendation before ordering. If you’re in need, NuggMD will get you certified in no time with their team of medicinal cannabis doctors available online everyday. The process only takes a few minutes and just costs $39! “Beyond beautiful packaging and convenient matches that comes with the joints, they burn smooth, I love the taste and the flower is grown organically?! Personally really like the hybrid and sativa blends. My friends and I are hooked.” —Ry L.
“I love this [indica pre-roll pack]. This thing was an experience from buying it in the store to popping it open, pulling it out, feeling it in my hands…It feels like the way joints should be. I love this.” —Matt N.
“I literally have tried every pack and every blend! My favorite is the Sativa Blend, so sweet and full of flavor!! You guys gotta check them out.” —Alysia S.